With the traditionalists and boomers leaving the workforce to retire, the time has come to look beyond Gen X to the increasing numbers of Millennials in the workplace. The problem for businesses is that Millennials are not going to adapt to the workforce as it stands in the same way that Gen X has been mostly happy to do. Millennials demand that the workplace change to meet their needs and desires and when they aren’t happy they vote with their feet. This means that future business success is going to depend on each organisation’s ability to utilise effective performance management to engage staff and fill skill and knowledge gaps that appear when key staff members either move on or retire. A robust talent strategy building effective leadership pipelines at all levels of an organisation will further future-proof against the uncertainty that businesses are bracing for in a highly competitive global marketplace. For more information on building a better performance management system that helps to align your talent with business strategy, you can watch Performance Management: Improving on Traditional Offerings here. You can find more information on building a robust Talent Management Strategy here, and watch a video here. 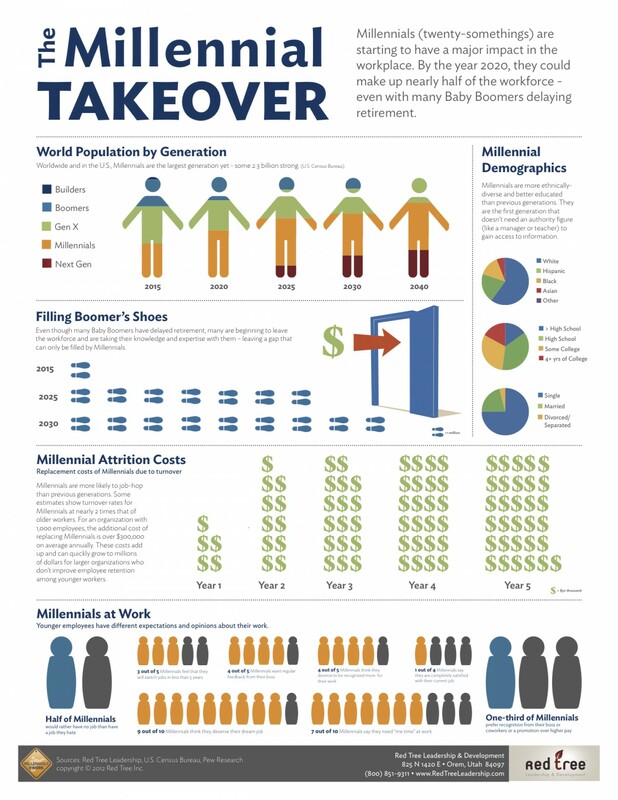 With the growing increase in the number of Millennials in the workforce, and the undeniable fact that they will one day be our leaders and CEOs, it’s time to find new ways to engage and retain them, otherwise businesses will face continual talent shortages and the burden of costs to train and retrain as Millennials continually move on to greener pastures. This entry was posted in Infographic and tagged analysis, best practice, CPD, development, effective, employee, employee development, employee training, engage, engagement, infographic, knowledge, learning, learning and development, manage, Millennials, motivation, needs, new employee training, opportunity, participate, Participation, performance management, professional, responsibility, skills, staff retention, statistics, Talent Management, training, training and development. Bookmark the permalink.